Et soveværelse, et badeværelse, alrum med nyt fladskærms-tv og queen size sofa trække sig ud sofaen. Et nyrenoveret stort køkken med nye apparater. Stor baggård med en brand pit og græsplæne spil. Gåafstand til stranden og smuk udsigt over vandet fra verandaen og ovenpå soveværelset. En helt ny gas grill til grillning i baghaven og nyd lange sommernætter. Et dæk vil blive tilføjet i sommer. Udlejningen inkluderer også adgang til Pleasure Beach, som er mindre end en 1/8 kilometer væk. Tæt på centrum af East Lyme og City of New London og mindre end 15 minutters kørsel til det historiske område Mystic og Stonington Borough. Mindre end 15 minutter fra Mohegan Sun Casino og 20 minutter fra Foxwoods Casino. Clean and cute! Was a great place for a little getaway with family. Nice to be able to see and take a short walk down to the water. Excellent location, wonderful small cottage. Lots of great restaurants and fun things to do nearby. Perfect getaway for a quiet birthday weekend. I needed a few nights for myself and my 11 month old grandson to stay while my home was being repaired-i wasn’t sure how long it would take. Stephen was great about being flexible with the check out date, And graciously refunded part of the rent when i needed to leave early. The home itself is adorable. Clean, nice location, well appointed. The decor made me feel like i was living in an “HGTV” episode-just beautiful. Many thanks for being just what i needed, when i needed it. 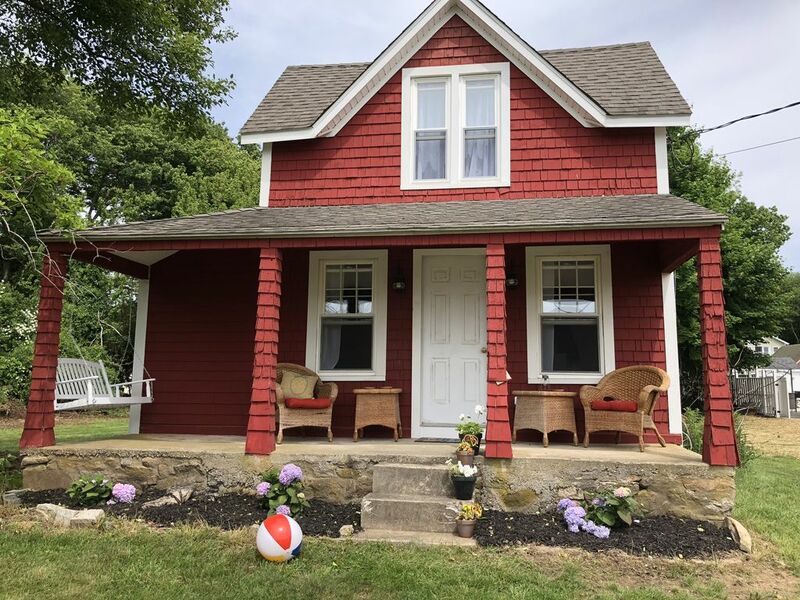 The Little Red Cottage is quaint and adorable! Not to mention very cozy with beautiful sunsets! This cozy and sweet home has everything one would want for a relaxing and tranquil stay! Pleasure Beach is a beautiful beach and well worth a visit. Make sure you visit Stonington Burrough, which is a great area with wonderful shops and beautiful scenery. There is always a worry that the mattress will be comfortable and I can say with honesty that the bed was very comfortable. Rest assure, you will get a good night sleep in the cozy Little Red Cottage.